Don't Let Lee Adama Be Our Last Defense Against Zombies! We're beyond excited about Frank Darabont's adaptation of Robert Kirkman's brilliant zombie-apocalypse comic The Walking Dead. This could be the best TV zombie series ever made - unless they cast Lee Adama over Jacob, in which case we're doomed. Big Shiny Robot has a very interesting scoop about who is going to play cop turned zombie killer Rick Grimes in AMC's new television series The Walking Dead. 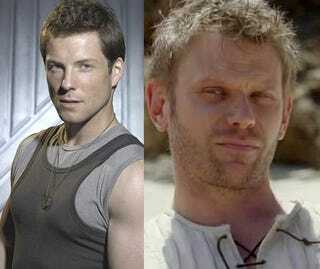 According to their sources Jamie Bamber (Apollo from BSG) is "in the running" for Grimes. But Mark Pellegrino, Jacob from Lost and THE DEVIL from Supernatural, is on said list as well. And Stuart Townsend is a last resort. AMC, please cast Pellegrino, we beg of you. Jamie Bamber is great and all, but isn't he a bit too pretty for the role of blood-soaked Rick Grimes? It's not that Bamber is a bad actor, we just don't see his acting style slipping into this particular character. Plus his Pulse 2 performance just soured this actor for us. Also, we're not ready to gamble with a major role like Rick Grimes on an actor who can't keep up with the cast of Dollhouse. Pellegrino, on the other hand, can do gritty. Plus, isn't Bamber dedicated to the UK's Law & Order-type show? But that's not the only name being thrown around - Stuart Townsend is also getting tossed around as a possible Rick, which kind of makes us want to cry. We're still pretty raw about his Lestat/Dorian Grey roles, so let's just say Townsend is a worst-case scenario. Honestly when we heard Pellegrino, we were sold. I mean, look at this Rick Grimes drawing, they're practically brothers!